March 15, 2019 | Bulgaria: Sofia | Source: Pernik Municipal Public Transport Co. 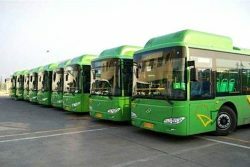 In Pernik, a city in western Bulgaria, Pernik Municipal Public Transport Company has issued a tender document for the supply of thirteen low floor buses powered by Compressed Natural Gas (CNG). Deadline for submission of tenders or requests to participate is April 8th 2019. The Ministry of Regional Development and Public Works has provided financial support for the project through the Operational Program “Regions in Growth” 2014-2020 for the modernization of the urban transport. The value of the acquisition is estimated at 4.2 million levs (USD 2.4 million/ EUR 2.1 million), excluding VAT. With a body length of between 8 and 12 metres, the category M3 buses must be rated EURO VI for environmental performance, operate with CNG fuel and have an engine located at the rear of the bus that delivers at least 180 KW. Bids will be ranked based on price which will form 50% of the final mark, energy efficiency, warranty period and other technical criteria. Deadline for submission of tenders or requests to participate: 08/04/2019 17:00. A CNG refueling facility is funded as part of the overall project, separate to the above mentioned figures. Documents are available from this webpage.